Our school year is winding down, and the Schoolhouse Review Crew is sharing all about staycation ideas. To me, that means doing things that are a little outside of the norm, a bit of extra fun beyond the every day typical fun. In the past, we have set up the tent in the yard for a camping trip at home. We typically prefer doing things as a family, but my husband and son have even spent the night in the camper while the girls and I watched several hours of Jane Austen movies and painted our nails in the house. Don't miss the ideas shared by the crew about staycations. Our family is making our summer bucket list, so I'll be reading them all for fun ideas to add to our list. 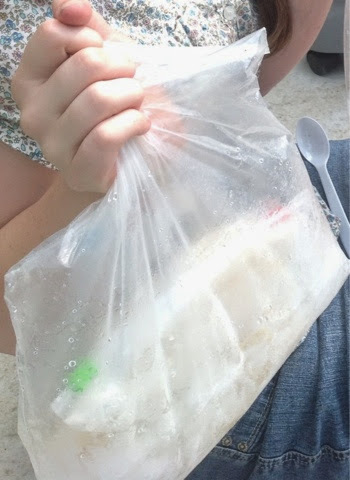 Last summer, for the first time in a very long time, we made ice cream in a bag. We were recently reminded of that fun treat at a friend's house, and it is going to be a more frequent treat around here, especially on the really hot summer days. Optional, add 1 1/2 teaspoon cocoa powder to the mix before shaking, but an additional 1/2 teaspoon of sugar is needed to keep the cocoa from making the ice cream bitter. You will need the above measurements and supplies for each serving that you prepare. 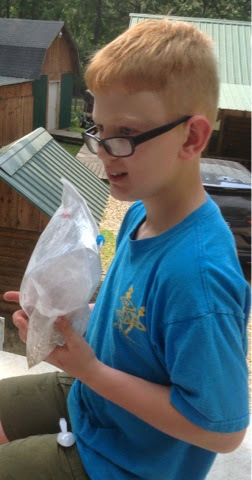 Directions: Prepare the outer bag by placing 3-4 cups of ice and 1 tablespoon of rock salt in a gallon ziplock. IMPORTANT: to prevent your ice cream from tasting salty, double bag the next step. Nest two quart ziplock bags together. Into the inside one, pour first three ingredients into inner ziplock bag. Seal both quart bags with air pushed out of bags. Put them inside the gallon bag with the ice and salt. Now the fun part-- shake, shake, shake! Keep turning and shaking the bag taking care not to puncture the inner ziplocks. Shake it until the milk mixture turns into ice cream. When it hardens, take care to remove the inner bag without allowing the salt water to touch the ice cream. You can pour it into a bowl or eat it right out of the bag. Enjoy! I've been thinking of planning some "staycation" activities too. Thanks for a great idea! My kids and I made a "summer bucket list" of things we can do at home. I've enjoyed seeing just what they are most enthusiastic about doing. Ooooh, ice cream in a bag! I did that a couple years ago and I was surprised that it actually turned out! We didn't go anywhere for vacation last year and we probably won't go anywhere this year either. I've been trying to think of some staycation ideas. Last year I made a bucket list with my girls. I'm trying to decide if we'll do that again this year, or if we'll just go with the flow. i really liked this easy peasy recipe. me and my kids really enjoyed it. sounds really good too "ice cream in bag"